For most gamers, used games aren’t evil. Buying used means access to titles you might not be able to afford new. They also validate the day-one purchase of a new title, with the promise that you can at least get some of your money back on your full-price game investment. For publishers and developers, however, the secondary market represents a threat to profitability—even viability. Every used game sold (they say) means missed revenue for the people who created the software. These sales cannibalize profits on new titles, and make the prospect of launching a successful AAA title that much smaller. GameStop, the Grapevine, TX retailer that defined the used game market, stands at the center of the conflict, reaping the rewards of a controversy that it largely created. Examining the company’s bottom line shows just how big the rewards are—and how the firm might even be helping the industry. The mechanics of the secondary market are simple: A gamer takes her old titles to GameStop and trades them in, with the value for each game determined by title inventory and availability. The gamer can then spend her credit on anything in the store, from new titles, hardware and accessories to the store’s inventory of used hardware and software. Multiply that by thousands upon thousands of transactions and you have a healthy business model. According to the company’s earnings call on March 22, used software and hardware sales accounted for just over 27% of total sales in 2011, but a whopping 47% of all profit. Break that out into actual numbers: At the end of its fiscal year 2011, GameStop sold $5.6 billion in new games and hardware, compared to $2.6 billion in used inventory. Note the italics—this is an enormous business. For reference, Electronic Arts, the largest game publisher, sold only $2 billion in games in its previous 12 months. But despite the overwhelming topline impact of the new games—nearly 2:1 over used games—GameStop made only $952 million in profit off new products, versus $1.2 billion in gross profit from used games and accessories. The numbers tell us two things: First, sales of new games—at least through specialty retail stores like GameStop—are pretty impressive. But a closer look at the data also suggests that used game sales may not have as big an impact as many in the industry would have you believe. GameStop’s model has advantages for both consumers and publishers. First-in-line consumers know they can get resale value out of the initial $60 purchase, which GameStop executives argue helps drive new software sales in the first place. Without a built-in out for that new game purchase, there’s a greater chance that alpha consumers would wait well past the first day of release, hoping for a sale. The more far-reaching advantage is tied to trade-in credit. GameStop said in its March 22 earnings call that it generated $2.6 billion in sales for used games and accessories. Wedbush Securities analyst Michael Pachter estimates the company also paid out around $1 billion in in-store credit for trade-ins. "That billion dollars is used as a currency to buy new games," Pachter said. For perspective, the NPD group estimates total sales in the industry at roughly $16.6 billion, which means GameStop’s $1 billion of trade-in currency equals roughly 6% of total sales. "Most people who trade in used games don’t turn around and buy used games," said Pachter. "They trade in used games so they can buy new games." 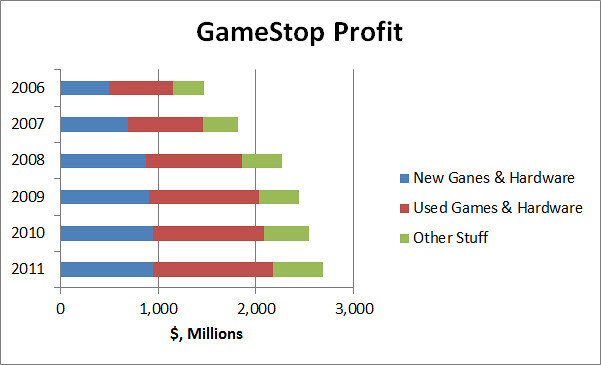 It’s not a generalization: GameStop's own data bears this out. 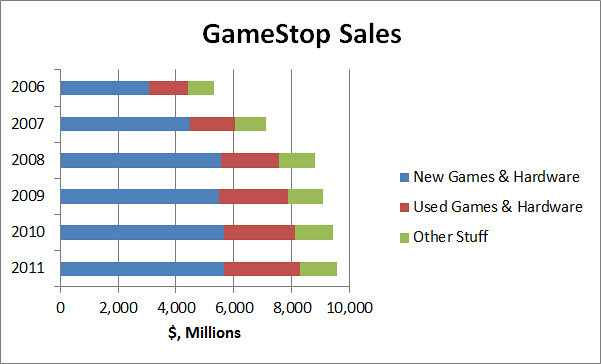 Speaking to the Dallas Morning News in August 2009, GameStop CEO Paul Raines provided statistics in defense of the used game market, stating that 70% of trade credits from used games immediately go into sales of new software. On top of that, only 4% of used games sold by the retailer have been released in the past 60 days, thereby having the chance to cannibalize new software sales. One could argue that the availability of cheaper software actually increases the user base long term. Consumers who normally wouldn’t purchase a game at the full value now have a chance to join a game’s established player base. If you can’t get on the $60-a-pop Mass Effect train for 3 games in a row, maybe you can go the cheap route for the first two, get hooked, and then splurge for the collector’s edition for the finale. Forget for a moment that the person buying said used game isn’t giving money upfront to the publisher—DLC and potential subscription-based content can mean that secondary consumers are possibly extending a franchise lifespan. In pure numbers, 4% of used game sales cannibalize new game sales and 6% of new game sales are fueled by game trade-ins. "On balance," said Pachter, "it’s pretty friggin’ neutral." Neutral or not, publishers would rather have the dollar today, than the loyal customer tomorrow, so they are taking steps to make new software purchases more attractive. Electronic Arts has spent enormous effort on this, although not everyone likes the solutions it’s come up with. For its newest titles—SSX and Mass Effect 3—EA employed an “Online Pass” system that locks out content until a code is provided. New purchases have an insert in the case with the required code, but theoretically those trading in SSX at GameStop would have already used the code. In most cases, the Online Pass is tied to multiplayer content, but a few titles have withheld single-player content for those without a code. New codes can be purchased as DLC through both Xbox Live and PSN. This gives EA a potential revenue stream straight from the pocket of the gamer who just grabbed SSX off the used rack, direct from consumer to EA, with no middle man. Critics of the online pass system say it punishes consumers who opt for the cost savings in used games. They view the additional fee required for all content as a slap in the face, or as potentially limiting the value of a trade-in. Whether or not that’s true is still up in the air—there’s precious little data to show if a successful title like Mass Effect 3 was hurt or helped by online passes. There are, of course, other solutions. Pachter suggested GameStop hold off on accepting newly-released titles for trade-ins. "The only part publishers don’t like is used games sold approximate in time to the release of new games," he said. "I think before a publisher would bring pressure to bear on Microsoft or Sony to block used games, they’d probably be smarter to say to GameStop, 'Hey, cut us a break. Don’t accept trade-ins until a game’s been out for three months.'" Pachter envisions GameStop imposing a credit limit for newer titles. "The way to regulate that is to just say, 'We will never pay more than $20 for a trade-in.' It’ll piss you off to sell your $60 game for only $20." The likelihood that GameStop would bite the hand that feeds it, however, seems slim. Limiting payouts on trade-ins would diminish the amount of "currency" available for new purchases, and no company likes to leave money on the table. What about locking out used games right in the hardware? Rumors this spring have circulated about a successor to the PlayStation 3, dubbed "Orbis." (Hey, Vita turned out to be real, so who knows.) Under the list of imaginary or leaked specs, news centered on a supposed plan from Sony to “block” used games from operating on the console. "Orbis is apparently locking titles to PSN accounts so as to lock down on the used game market," wrote Ross Miller at The Verge. Because they're only rumors, take them with a grain of salt. It’s not in Microsoft's or Sony’s best interest to fight against the secondary market. "Each of them sells way less than 10% of the software on their own consoles," said Pachter. In fact, in Microsoft’s case, Pachter speculates that only one percent of revenue for the Xbox division comes from publishing games that could be sold as used. "Why would they ever risk alienating consumers over one percent?" What’s more likely is that both Microsoft and Sony will push deeper into digital distribution. Sony’s Vita is the model: AAA titles are released both in digital and physical formats, giving consumers a choice while leaving existing distribution channels with retailers open. It’s still too early to know how well that’s working, but it’s safe to say Microsoft and Sony will continue the push when the next console cycle begins. No matter what, used games aren’t going away anytime soon. Gamers will continue to trade in old titles, while publishers will continue to develop more reasons to buy new. You’ll think of GameStop as the place next to the Orange Julius in the mall. EA will think of them as the big brother with the baseball bat and a bad attitude. And either way, GameStop wins. I've always felt it was unfair of the industry--at least, the bigger companies in the industry that focus on consoles (and treat the industry like just so many packaged goods)--to criticize GameStop: would the videogame industry *be* the industry it is without GameStop? They can call a used game a missed sale all they want, but I wonder how many sales they would be missing if there hadn't have been a McDonald's of video games out there in every mall to put video games front and center for all those years. Another factor in EA (and other publisher's) chagrin is the fact that they simply don't understand the concept of what I'm calling a "long-tail" gamer. If a sales activity doesn't happen in the first week, they have no idea what to do with it. They and their PR people have no tracking or metrics that can cope, and as a result they feel threatened or ignore that entire segment of the market. 'Hey, cut us a break. Don’t accept trade-ins until a game’s been out for three months.'" Pachter envisions GameStop imposing a credit limit for newer titles. "The way to regulate that is to just say, 'We will never pay more than $20 for a trade-in.' It’ll piss you off to sell your $60 game for only $20." The likelihood that GameStop would bite the hand that feeds it, however, seems slim. I dunno, you could maybe see more than that in the first 2 weeks, but past that point I don't think I've ever seen trade in value more than $20 as things already stand. Am I totally hallucinating this being the case? "Most people who trade in used games don’t turn around and buy used games," said Pachter. "They trade in used games so they can buy new games." It's quite likely one of those "conventional wisdom" things that is simply untrue, like so many other commonly-held beliefs. I've said it before and I'll say it again: the fact that the used game market is thriving is a signal that new games are overpriced. If publishers kill the used game market then they'll price the most price sensitive consumers out of the market and most of them are kids. Price kids out of the market and in most cases they never come back. I've never had a problem with Gamestop's reliance on used games, and while I can see the argument from the publisher's perspective, that isn't the reason I avoid Gamestop. I opt out of buying anything at Gamestop because of the people and policies they employ. It highlights the last nail in the coffin for me going there. They're focusing so much now on used because it does make them money, but as someone who doesnt like to do trade ins it makes them obsolete. You forgot about someone. Nintendo announced last week that they'll be selling both physical and digital copies, day and date, of both Wii U and 3DS games starting at launch with the Wii U and in August with New Super Mario Bros. 2 on the 3DS. Not only that, but they made what looks to me like a pretty savvy business move. Not only will people be able to buy digital copies of games directly through the Nintendo Network/eShop, but they'll be able to buy codes for digital copies at retailers. (They may even be able to download them on 3DS directly in store with Nintendo Zone.) The smart bit is that retailers will be allowed to set prices for the digital copies sold in their stores, which means they can be put on sale, get price drops, and so forth, just like physical copies. That gives consumers and retailers alike a choice in how they'd like to hand digital distribution of games. I'll be curious to see how many of those used game dollars at GameStop go right into digital copies of games. Ugh, please don't quote Pachter. Never had a problem with Gamestop's people; they try to pre-sell me stuff, I say I'm not interested, we move on. I don't want game discussion at a retail outlet; that's what I have GWJ for. I don't expect intelligent conversation about toilet paper when I but it at Wal-Mart; why should I want it about games at Gamestop? I use GameStop to get rid of old games and get new ones with the proceeds. I have been able to take a risk on many new games because of this. Complaining about GameStop is like complaining about Wal-Mart. They are a behemoth and likely will not go away until market forces change significantly. You are one of those Charminists aren't you? Or worse one of those masochistic Scotties? Its all just speculative, just like piracy. It relies on a baseless assumption that a person who buys a game used is a lost new game sale. Just like they consider a pirated game as a lost sale. There is absolutly no hard data to show that either of these assumptions are true. Just like most things in data analysis there is probably some segment of the population of game buyers who would purchase a new game if a used one was not available, but is that even more than 1%, 5, 10, who knows. Acting like its 100% is nutty. How many of those used game sales actually result in a new game sale; how often does a trade-in credit allow a consumer to buy a new game they might otherwise not have? Just by the volume in the pretty simple numbers you've shown I would imagine its quite high, and something they can probably measure. Just like someone might pirate a game to "demo" it and then actually purchase it. I don't really care cause im a pc gamer and this is a weird physical media console problem that I honestly don't care about but the parallels between piracy and this issue are interesting. And I don't pirate or advocate piracy but really can't stand the DRM and other crap that we the paying public have to deal with out of paranoia over the piracy problem that is based in pure speculation, i.e. I don't buy UBISOFT products anymore. For me, $5 off of the price of a game will never be worth buying a used copy. It's a stretch, but $15-20 might be enough depending on the situation. The only time I buy used at gamestop though is when they no longer have a new copy and the game is out of print. In that case, it's absolutely essential that used games are allowed... I usually don't even mind paying an extra $10 to get some missing bit once I get the used game home in that instance. I do trade my old games in after I've either platinumed them or given up on them. It helps make the new games more affordable. Speaking of that, I have 5 new games coming out the next 2 months. I should plow through and finish some games here so I have something to trade in. As for pre-selling stuff, I do it all the time, I also pre-pay games that are coming out soon to make absolutely sure I get a copy even if my finances take a turn for the worse. Most examinations of the used game market fail to acknowledge that even if someone who trades in a used game sometimes uses the money to by a new game, it is more than offset by the game they traded in which will displace a new game sale. In a world with used game sales, Customer A trades in Uncharted 3, 70% chance he used the credit to buy a new copy of Mass Effect 3. Customer B comes in to buy Uncharted 3, and gets that used copy instead of a new one. Publishers net .7 units sold. In a world without used games, Customer A is less likely to buy Mass Effect 3 because he has less money, but there is some chance he still will, say 25%. Customer B is likely still going to buy Uncharted 3, but has to buy it new. Say 80% chance he still buys it new even though it is a few dollars more. So publisher will net 1.05 sales. That's a 50% increase in new game sales, and for these companies that are losing money and looking at bankruptcy, the difference between profitability and layoffs or bankruptcy. I think there is a good fairness argument in support of used games sales, but it is ridiculous to try and spin them as financially positive for publishers. "As a result only 16% of used book sales at Amazon cannibalize new book purchases." i.e. publishers lose 16% of potential sales at Amazon. "This increase in consumer surplus, together with an estimated $45.05 million loss in publisher welfare and a $65.76 million increase in Amazon's profits, leads to an increase in total welfare to society of approximately $87.92 million annually from the introduction of used book markets at Amazon.com." So what the article and abstract are saying is that Amazon wins, consumers win, publishers lose. It isn't 1 to 1, but it is substantial. Nice article, but citing Pachter is a death sentence to the credibility of any content. Normally I'd agree, but Pachter isn't making any predictions here. Not really. These quotes are actual analysis of information that's put front and center. He's not saying "based on these read-outs, I think the market will do blah and blah". That's when quoting him is a death sentence. This actually made me wonder if Nintendo has a long-tail perspective or not. Back when GameCube and Xbox and PS2 were the thing, I remember several years old Nintendo games still selling at $50 while other games had already knocked down in price. The big thing was because Nintendo COULD sell those games at full price because people would buy them anyway. I think the idea is when someone buys a console when it gets cheaper, they'll still be willing to pay top dollar for all those games they missed? I don't know. I'm very bad with business and economics, but it's something that occurred to me after reading your post. I'm just glad if I can find a good two or three year old game brand new. If I hate anything about GameStop, it's the fact that any copy on the wall hasn't been re-shrinkwrapped. I can't believe they stopped doing that (allegedly, it was after an employee burnt themselves on the machine. I hope that is false). Though one thing still pissed me off, though. Buying Gears 3 on day one brand new, opening the bag, and finding a pamphlet asking me to trade the game back in. The downside there is that you'll still be paying full retail price on the digital version, though I don't suppose that's worse than most other digital services. You'd think people would have learned from Steam Sales by now, but, well, I guess that requires actual knowledge about the industry you're trying to be a part of? I have to say that I'm of similar mind to HedgeWizard. The used games industry doesn't bother me, and in fact, I hope it doesn't go away. I would have a serious problem if game publishers suddenly told me that I can't sell a game that I legally purchased. It would be the DRM problem all over again. That said, I don't shop at GameStop because I don't like some of their policies, but that shouldn't condemn an entire industry. Or when he's saying what the industry should do, as he's doing here. I think the crux of the matter is that for many companies in the games industry their business model is broken. Rather then adjusting to the changing realities of the world operate in, they use the used games niche of the industry as a whipping boy and a distraction from their business failures. Lets talk about another industry that has a used goods markets the car industry. How many of you bought a used car? Is the used car market responsible for the recent business failures of the big 3 USA car makers? How would the car industry look if the manufactures were trying to clamp down on used car sales? How come when you go to buy a car nearly every car dealership also has an inventory of used cars, not to mention the plethora of used car dealerships. Having the right to sale what you have previously purchased helps the economy and society to thrive, that's why we have the first sale doctrine. Start messing with that and you'll only inviting doom. A changed business model (ie. eliminating used games) would not significantly change the amount of money that gamers would spend on games. To put it another way: GameStop and the game companies are advertising and setting price points for optimal overal sales. No one is letting a buck slip by. It might affect WHICH games are purchased, and WHEN, but basically we're all spending all of our allowance on games. Then, the question is, where is our money going? Item 1 is clearly a place we want money to go: more money for development means more and better games. Item 4 is debatable. Having a local game-house is convenient, and it's good to have a knowledgeable human around when you have hardware problems or need to return a defective item. It forms some sort of community, and gives some local employment. But do I want to pay for it? I think most of us realize intuitively that this is how it works, and so we are largely ambivalent to the argument. To a large extent, this is a turf war between two corporate groups who each want a larger slice of the profit pie. Each is trying to co-opt gamers to support their cause, but neither makes a strong case. I'm neither convinced GameStop keeps overall accessibilty better, nor am I convinced that if GameStop dissolved, the extra resources would go towards doing anything I wanted. Good article, Demiurge. It's refreshing to see a well researched, thoughtful analysis done to "defend the devil" as you say. I kind of akin the sale of used games to the gaming industry to the selling of used cars to the auto industry (with some exceptions...wear and tear on a game doesn't factor into its sale or worth). The selling of used cars is hugely profitable for the dealerships whereas new vehicles are not as much so. It could be beneficial to the consumer to get a quality good at cheaper prices. But I also think that it could harm the consumer. I wonder if the used game market limits the ability for publishers and retailers to discount the prices of new games should they not get the sales that they expect. iTunes and Steam have proven time and again that people will purchase "new" content for the "right" price. Edit: Partially Tannhauser'd on the used car thing. D'oh! My first reaction: all the arguments in the discussion are largely hand-waving. Except in the article itself. Cory should be commended for putting real numbers to this debate. I think the crux of the matter is that for many companies in the games industry their business model is broken. Rather then adjusting to the changing realities of the world operate in, they use the used games niche of the industry as a whipping boy and a distraction from their business failures. Yes! I agree with this completely. Many companies in the big content industries (music, movies, games, etc.) simply refuse to admit that the marketplace is changing and that the need to change their business model. Piracy, used games, they're all lame excuses from companies unwilling to change. Maybe I'm living in the bubble a little bit, but when I look down my friends list and around at GWJ, I see a lot of folks playing games that are don't have that new car smell anymore. We talk a lot about the $60 price point, but we don't talk about that same game 6 months down the line at the $30 price point, and that's honestly where most of my game purchases happen. I'll pick up a handful of games on day-one over the course of a year, and the rest are discount purchases, games bought new at around that magic $30 price point, usually during a sale of some kind. I barely buy used anymore, because I can buy "cheap" new games just fine. Do you play a lot of multiplayer titles? That's certainly a factor in the industry's push for first-week sales. Like Kohler's piece in Wired a while back, this piece offers exactly what the used game discourse needs - hard numbers. It's excellent analysis and, as somebody who's traded Twitter snark with you on this topic more than once, I really appreciate that you took on the challenge of doing the leg work. Awesome job. Yeah - I didn't mention it above but I like this general concept of looking at what everyone "knows" from the standpoint of the hard numbers out there. You can find some intriguing correlations that can give insights to a situation. Game publishers need to seriously have a come to Jesus meeting and take a long hard look if that 2% (based on the figures quoted, "In pure numbers, 4% of used game sales cannibalize new game sales and 6% of new game sales are fueled by game trade-ins.") is worth the lost sales and PR debacle (like EA being labeled the worst company in America), in part due to their attempts to block out or control the used market and piracy with their online pass and DRM tactics.